Dr. William A. Young II is the Director of the Online Masters of Business Administration (MBA) program at Ohio University’s College of Business. 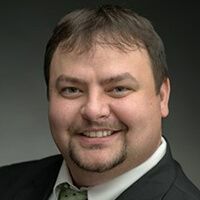 He is also an Associate Professor of Business Analytics in the Department of Analytics and Information Systems and the Associate Director of the Sogeti-Ohio Young Professional Development Program at Ohio University’s College of Business. Since joining the College of Business, Young has been recognized as a Charles M. Copeland Fellow and he has won awards for teaching and research. Young earned his doctorate degree in Mechanical and Systems Engineering from Ohio University in 2010, where he won the 2009-2010 Outstanding Graduate Doctoral Student Leader Award at the university’s annual Awards Gala. William also received a bachelor’s (BSEE) and master’s (MSEE) degree in Electrical Engineering at Ohio University in 2002 and 2005 respectively. William has collaborated with multidisciplinary teams of faculty, students, and professionals on projects and programs that have been funded by General Electric Aviation, the National Science Foundation, Sogeti Netherlands, and Ohio’s Department of Labor. Young’s primary research is focused on descriptive, predictive, and prescriptive analytics, where he has developed and deployed a variety of statistical and machine learning-based methodologies and applications. Based on his multidisciplinary endeavors, Young has various peer-reviewed articles related to operation management, healthcare services, and environmental systems, as well as specific interests in quantitative sports analysis, and educational technologies and techniques for innovative teaching instruction. Dr. Young received his B.S. in Electrical Engineering in Digital Systems with a minor in Mathematics his M.S. in Electrical Engineering with a concentration in Engineering Management and his Ph.D. in Mechanical and Systems Engineering, specializing in Systems Engineering. Dr. Young received all of his degrees from Ohio University’s Russ College of Engineering and Technology.